Instead of finding a good company, self-made billionaire Jack Ma said during his recent Manila visit that job-hunters should find a good boss. "When you are 20 to 30 years old, find a good boss," he shared. "When you're 30 to 40 years old, do something you want to do for yourself. When you're 40 to 50 years old, do something you are good at. When you're 50 to 60 years old, focus on helping other people. When you're over 60 years old, spend time with your grandchildren." The quote above quickly went viral on social media. A lot of netizens, especially those in their 20s and 30s, seemed to relate and agree with the tycoon's words of wisdom. In reality, however, do you think that having a good boss is enough of a factor for an employee not to resign from a position? According to the 2017 Job Happiness Index Report by JobStreet.com, having a good relationship with colleagues (including the boss) greatly affects an employee's drive to stay in a company. 4.71 percent of the respondents (9,326 Filipinos were surveyed; read more here) agreed that co-workersÂare responsible forÂoccupational happiness. However, the findings were not the same for all ages. Ironically, only members of Generation Zâor those 18 years and youngerâbelieve that relationships with colleagues are important. As for the millennials (those who are 19 to 35 years old, and compose the majority of workplaces), they identified two factors that make them satisfied with their jobs: colleagues and work location. "The results of this study serve as a wake-up call for companies who wonder why there is such a high turnover rate," JobStreet.com Country Manager Philip Gioca explained. 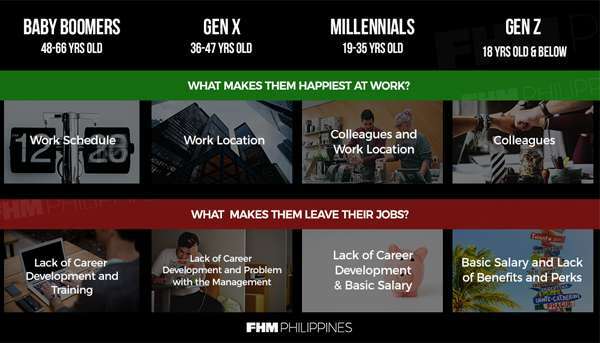 Career development, training opportunities, and the management style of the company's leadership team are just some of the reasons why many Filipinos are unhappy in the workplace. It would be best if managers can get to the heart of why this is happening as each company's DNA is unique.